Jordan Peterson, Masculinity, Jung and the Alt-Right. As a clinical psychologist specialized in working with boys and men, people have been asking me why clinical psychologist Jordan Peterson appeals to the alt-right. So after watching his videos and perusing alt-right forums here are my thoughts. His ideas are not that controversial if you accept some of his questionable premises and choose to step into his metanarrative world. Therefore his ideas alone don’t explain why some members of the alt-right have chosen him as their poster boy. Which focusses us to look at the paradox of this at times clinical psychologist, social psychologist, self-proclaimed rational man of science, and at other times a metaphysician, and as of late a political activist, as a possible explanation for his appeal among this group. Much of Jordan’s criticism concerning equality and identity politics, that he states are the product of the left-wing autocratic, Mao-like, tyrannical inklings of radical feminism and the tyranny of the minority, is based on trait theory research. He claims that women are underpaid, partly due to being a woman, but also due to other “universally”, “statistically” based psychological traits such as agreeableness. The problem with trait theory from a clinical perspective is that no clinician worth his or her salt would reduce the human experience to an immutable trait, and has the insight to grasp the basic fact that humans are contextual beings. Similarly to how dissociative identity and borderline personality disorders develop in the context of severe relational trauma in childhood. And our contexts are not limitless because we are partly bound by biology and evolution, and highly determined by our interpersonal relationships and civilization (for a more detailed explanation on this, please refer to this article). Furthermore, trait theory pulls for more symptom-based clinical interventions, essentially depriving individuals of the full narrative of their lives. The validity of trait theory relies solely on statistical analysis, and when applied to psychology highly reduces the complexity of the human experience to bite size chicken McNugget constructs. Unfortunately, give a child a hammer and everything becomes a nail. One could plug in almost any variable into the black box of statistical analysis and prove its statistical validity. This is where he sacrifices clinical wisdom to the service of social psychology to further his political views. And since there is money to be made, Youtube hits to be counted, and careers and promotions to be had, either compassionately or aggressively, the system will keep feeding off its own tail. Also big business loves personality traits because profits slow down when corporations are asked to digest human capital challenges bigger than bite size McNuggets. Furthermore, traits help maintain dominant value systems, rendering them rather impervious to novel phenomena that may call into question the status quo. Also, trait theory shares its philosophical roots with eugenics which played an important role in Nazi atrocities and the Rwandan genocide. Therefore, one could argue for effect that we are just one trait away from genocide, and that we should police academics who teach such a potentially dangerous subject. But such a paranoid extrapolation would only feed into a debate that does not serve life and diminishes our capacity to engage in a truth-seeking dialogue as we encounter real problems facing humanity today. And from a distance, when trait theory seeps into politics, it looks eerily similar to identity politics. As the rational man of science etc., who wrote a self-help book explaining to man-boys how to become men, it is rather baffling to hear him reference Carl Jung. Ironically, from Jordan’s masculinity perspective, Carl Jung should be the poster boy for man-boys: he never worked an honest day in his life by having married into money and spent several years brooding and playing in a sandbox after being fired by Freud. If that is not Jordan’s masculine definition of brittle, immature man-boy reactions, I don’t know what is. But don’t get me wrong, I like reading Jung and was a big fan of his in my early twenties. But over my 25 years of clinical practice never once has a client complained to me about problems with his or her anima or animus. Also, Peterson’s adherence to Jung’s ideas compounds the white male European (Freud, Jung, Lacan, etc.) tradition of mythopoeic triangulation by postulating hypothetical constructs (Oedipal Complex, animus-anima, Borromean knot, etc.) to circumvent the real interpersonal forces to explain their patients’ distress. From a clinical perspective, it is not very effective, nor empirically based, and fails to account for the relational contexts in which people experience distress. But it is interesting fiction for metaphysical extrapolation, which Peterson likes to do, but loses traction as he pounds the political activist drum. Hence the importance to vet our mentors and heroes wisely to the extent that their behaviours align with our values. Furthermore, Jung’s autocratic shadow imposed Mao-like totalitarianism over his wife and live-in mistress by self-appointing himself as their therapist and psycho-spiritual leader while overseeing their ordination as Jungian analysts. And some of Jung’s constructs were created and used to justify his infidelities and man-boy difficulties in committing to a healthy, mature and reciprocal adult intimate relationship, which according to Jordan makes women really miserable. Therefore, to reference Jung as the guiding mentor for a self-proclaimed rational man of science etc., and free speech advocating for man-boys to become men is highly suspect from a clinical perspective. And from a moral standpoint, we should judge a man based on his character and the extent that his behaviours align with his words. Hence the importance to vet our mentors and heroes wisely to the extent that their behaviours align with our values. 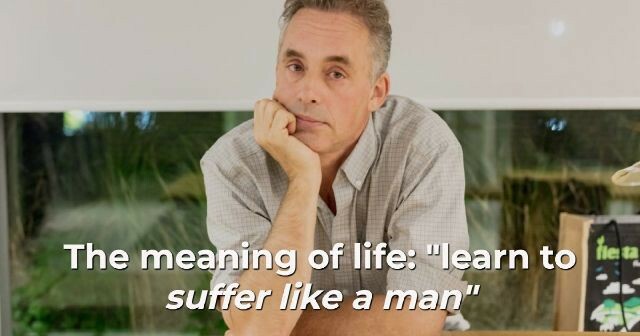 I find Jordan’s ideas of masculinity rather perplexing from a philosophical standpoint, but quite obvious from a clinical one. His relationships with men appear to be undercut by the threat of confrontation and violence. When he states that he only respects men he has to scream over to be heard and who awaken the threat of violence is rather revealing. In my over 20 000 hours of clinical work with boys and men, this dynamic often reveals unresolved childhood emotionally and or physically painful experiences at the hands of men and other boys, where they have been shamed for being fully human. And the more educated these men are, the greater the intellectual and intellectualizing edifices or armor they have constructed to protect themselves from their forgotten history. Ultimately, they have been robbed of their ability to trust other men with their vulnerabilities, and have cut themselves off from their core dependency needs, which as a species has been central to our survival. And these men tend to have a rather individualistic, me against the world stance towards life and others. Psychologically, these men are terrified of revealing their vulnerabilities and core dependency needs to other men for fear of being shamed by the brotherhood. Men have rarely reported to me experiences of being shamed at the hands of female teachers in primary school or university, as compared to these experiences at the hands of other hurt boys (bullies), brothers, fathers, and men, reinforcing their resolve to harden their armor. This ultimately cuts them off from their ability to be fully human and embrace life with resilience, creativity, and a compassionate will to power and meaning. The impact of this on their relationships with women, and especially “crazy” women leaves them feeling powerless, because the threat of physical violence is not within the feminine repertoire, and because other men are off limits as safe agents for emotional support and intimacy. And in Jordan’s case, it appears he has built his career on tax-payers money hiding behind political ideology and Jungian constructs and searching for obscure archetypal brain structures to justify his endeavor to avoid dealing with what seems obvious to me. And like the conflicted narrator in the sibyllic novel The Fight Club, Jordan, as a tenured professor, does not have any real skin in the game when playing political activist. But then again I may be wrong, projecting, or just anima possessed. And politically, as men and fathers, our life serving energies should focus on dealing with our “crazy” brothers like the executives at Monsanto; who are fighting their biggest legal battle to date to disprove the negative health effects of their products on our children and grandchildren. I mention Monsanto because Jordan was interviewed by the company about his political views. And paradoxically, Jordan was agreeable to the point of not mentioning the impending legal battle. Ironically, Peterson was used as an ideological pawn in the company’s PR campaign targeting millennials in preparation for the highly publicized legal battle. His references to evolutionary biology as a basis for his unifying theory of everything psychological is a slippery slope when it seeps into politics. Quoting lobsters’ serotonin fuelled hierarchical structures and behaviours is an interesting concept, however rocks and minerals are also part of our evolutionary history going back billions of years. Essentially, we can pick and choose from the vast array of disparate evolutionary data to shore up our theories and biases. Furthermore, how an author arranges this data within his or her world view is also reflective of the authors attempt to understand his or her own personal history and place in the world. Especially within the highly complex realm of human studies. Nonetheless, Peterson’s paradox may lie in his unawareness to the extent that he is “enframed” within multiple, at times conflicting, ideological systems that he portends can capture the complexity of the billions of neural networks that fuel the human experience, and through an ever-expanding system of interpersonal relationships, creates civilization. Potentially, such a paradoxical splitting, or in French, clivage, exposing his Jungian “shadow” captured within Freud’s repetition compulsion, revealed not so much in the content but in the tone and form of his political activism, is what may very well appeal to members of this group. From a philosophical angle, his political activism is creating what Wittgenstein would call false problems by playing different language games on incompatible fields. Tribalism relies on similarities, where the members feel a deep kinship with the shadow of their leader, and reflects more of a meeting of shadows than a meeting of minds. And Jordan’s shadow tribalism, which according to his lobster hypothesis does have an evolutionary basis, makes us question his self-awareness concerning the impact of how his somewhat questionable ideas are communicated and received amongst his alt-right followers. And there are multiple examples where he says or insinuates that radical leftists (i.e. radical feminists, etc.) have not yet killed millions of people like Mao did. He also threatened to police professors who teach courses tinted with radical leftist ideology. This sort of paranoid extrapolation is just but one example where his shadow merges with the alt-right’s shadow and into their agenda. Finally, every gardener knows to water the plants. But a wise, mature, conscientious and intelligent gardener chooses to water them with a mist and not a fire hose and filters out the toxins.